Let's talk about how I have become this crazy pie lady! I don't know where it came from. Actually scratch that, I blame my family. We never had cakes growing up - we always had pie. Fast forward to my cooking career and my love of pie has basically taken off. I wrote a cookbook on pie when I was in the Williams-Sonoma Test Kitchen and have loved, loved creating videos out of pie. It is universal, everyone loves a good 'ol pie. So in honor of Pi Day (as in the number 3.14159265359) - a day where bakers and mathematicians collide, I am making PIE! For the record I am just celebrating the pie part of pi day because I am in no way a mathematician - I can barely add sometimes. 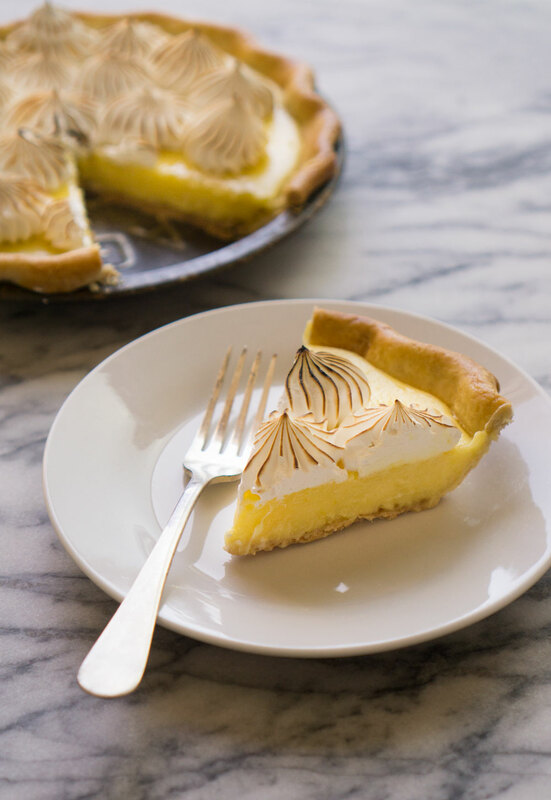 Since March is the time of transition from winter to spring and the produce is starting to become more abundant in berries and fruit, I am making one last ditch honor to citrus season with a lemon meringue pie. Oh and let's be honest I just wanted to blow torch something. First, you can skip the meringue topping and just use whipped cream. Also if you don't own a kitchen torch, not to worry the broiler in your oven works as well. Lastly, the lemon filling to this pie makes an incredible lemon curd - just don't bake it in a pie, instead store in it your fridge in a mason jar and serve on top of toast or yogurt. On a well floured surface roll out pie dough until approximately 1/8" thick. Gently roll the pie dough around your rolling pin and transfer to pie plate. Fit the dough inside the pie plate then crimp the edges. Freeze for at least 30 minutes. In a small bowl combine 1 egg with the heavy cream. Using a pastry brush, brush the edges of the pie with the egg wash. Place a piece of parchment on the pie, followed by a piece of tin foil. Fill the pie with pie weights and bake for about 15 to 18 minutes or until crust is cooked through. Carefully remove pie weights, tin foil and parchment paper and allow the pie crust to cook for about 5 minutes or until the edges begin to turn golden brown. Allow the pie crust to cool while you make the rest of the pie. In a large bowl, combine 3 eggs, 3 egg yolks (saving the egg whites for the meringue), 3/4 cup sugar, lemon juice, lemon zest and pinch of salt. Whisk well to thoroughly combine. Fill a medium sized pot with 3 inches of water and bring to a simmer over medium heat. Place the bowl on top and cook lemon filling for about 8 to 10 minutes or until the lemon mixture coats the back of a spoon, whisking constantly. Remove lemon filling from heat and whisk in butter. Pour lemon filling into the prepared pie crust and bake for about 20 minutes or until the filling is just set (it will jiggle slightly). Cool to room temperature then refrigerate overnight. Make the meringue by combining the reserved eggs whites with the remaining sugar in a medium sized pot. Place over medium heat and cook for about 2 to 3 minutes until mixture is warm and sugar has dissolved. Carefully pour the mixture into a stand mixer and beat on high with the whisk attachment until the egg whites are white and fluffy. Add vanilla extract and beat until just combined. Assemble the pie by either piping on the meringue or spreading on top. Using a kitchen torch or your oven broiler, brown the top of the meringue. Serve immediately.